Le, Anh 2018. The Alternatives to War, by James Pattison. Journal of Military Ethics, Vol. 17, Issue. 2-3, p. 177. Pattison, James 2018. Introduction. Ethics & International Affairs, Vol. 32, Issue. 03, p. 279. Mythen, Gabe 2016. The Palgrave Handbook of Criminology and War. p. 45. 1 Hurka, Thomas, “Proportionality in the Morality of War,” Philosophy & Public Affairs 33, no. 1 (2005), p. 35. 2 Bufacchi, Vittorio, “Two Concepts of Violence,” Political Studies Review 3, no. 2 (2005), pp. 193–204 , doi:10.1111/j.1478-9299.2005.00023.x. See, too, Coady, C. A. J., “The Idea of Violence,” Journal of Applied Philosophy 3, no. 1 (1986), pp. 3–19 , doi:10.1111/j.1468-5930.1986.tb00045.x. 3 Galtung, Johan, “Violence, Peace, and Peace Research,” Journal of Peace Research 6, no. 3 (1969), pp. 167–91. 4 Ibid., p. 168 (emphasis in original). 6 Evans, Gareth et al. , The Responsibility to Protect: Report of the International Commission on Intervention and State Sovereignty (Ontario, Canada: IDRC Books, 2001), p. 29. 7 Walzer, Michael, Just And Unjust Wars: A Moral Argument With Historical Illustrations, 3rd ed. (New York: Basic Books, 1977 ), p. 84. 9 Cécile Fabre, Cosmopolitan War (Oxford: Oxford University Press, 2012), p. 5. 10 Orend, Brian, “War,” Stanford Encyclopedia of Philosophy (2005), plato.stanford.edu/entries/war/. 11 Hurka, “Proportionality in the Morality of War,” p. 35. 12 McMahan, Jeff, “Just War,” in Goodin, Robert, Pettit, Philip, and Pogge, Thomas, eds., A Companion to Contemporary Political Philosophy, Vol. 2, 2nd ed. (Chichester: Wiley-Blackwell, 2012), p. 673 (italics in original). 13 Pattison, James, Humanitarian Intervention and the Responsibility to Protect: Who Should Intervene? (New York: Oxford University Press, 2010), p. 34. 14 Brunstetter, Daniel R., “Trends in Just War Thinking During the US Presidential Debates 2000–12: Genocide Prevention and the Renewed Salience of Last Resort,” Review of International Studies 40, no. 1 (2014), pp. 77–99 , doi:10.1017/S0260210513000028; Barack Obama, “Remarks by the President at the National Defense University” (National Defense University, Fort McNair, Washington, D.C., May 23, 2013), www.whitehouse.gov/the-press-office/2013/05/23/remarks-president-national-defense-university. 15 Barack Obama, “Remarks by the President in State of the Union Address,” January 20, 2015, https://www.whitehouse.gov/the-press-office/2015/01/20/remarks-president-state-union-address-january-20-2015. 16 Pattison, Humanitarian Intervention and the Responsibility To Protect, p. 82. 17 Frowe, Helen, The Ethics of War and Peace: An Introduction (Abingdon: Routledge, 2011), p. 62. 18 Walzer, Michael, Arguing About War, 1st ed. (New Haven: Yale University Press, 2004), p. 88. 19 Hurka, Thomas, “Proportionality and Necessity,” in May, Larry, ed., War: Essays in Political Philosophy (New York: Cambridge University Press, 2008), p. 129. 20 McMahan, “Just War,” p. 673. 21 Mellow, David, “Iraq: A Morally Justified Resort to War,” Journal of Applied Philosophy 23, no. 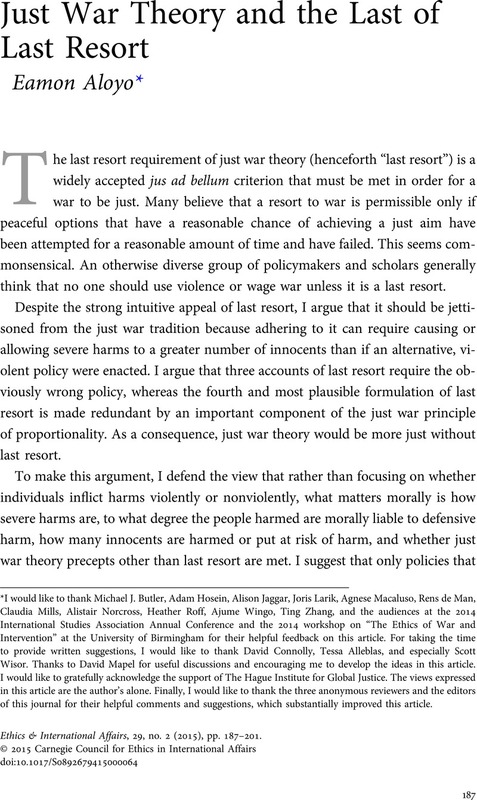 3 (2006), p. 300, doi:10.1111/j.1468-5930.2006.00342.x; and Coates, A. J., The Ethics of War (Manchester: Manchester University Press, 1997), p. 197. 22 Coates, The Ethics of War, p. 197. 23 McMahan, “Just War,” p. 673. 24 May, Larry, Aggression and Crimes Against Peace (New York: Cambridge University Press, 2008), p. 87. 25 Coates, The Ethics of War, pp. 190–92. 26 Ibid., p. 190. The quote is from Coates, not Churchill. 27 Lango, John W., The Ethics of Armed Conflict: A Cosmopolitan Just War Theory (Edinburgh: Edinburgh University Press, 2014), pp. 147–51. 28 O'Brien, William V., The Conduct of Just and Limited War (New York: Praeger, 1981), p. 33. 29 Pattison, Humanitarian Intervention and the Responsibility To Protect, p. 82. 30 Hurka, “Proportionality and Necessity,” p. 127 (italics in original). 31 Caney, Simon, Justice Beyond Borders: A Global Political Theory (New York: Oxford University Press, 2005), p. 202. 32 Lango, The Ethics of Armed Conflict, pp. 149–51. 33 Lango, John, “The Just War Principle of Last Resort,” *Asteriskos 1, no. 1/2 (2006), pp. 14–15 ; Lango, John, “Before Military Force, Nonviolent Action: An Application of a Generalized Just War Principle of Last Resort,” Public Affairs Quarterly 23, no. 2 (2009), p. 121; and Lango, The Ethics of Armed Conflict, pp. 149–50. 34 Lango, “The Just War Principle of Last Resort,” p. 16; and Lango, “Before Military Force, Nonviolent Action,” p. 121. 35 Lango, “The Just War Principle of Last Resort,” p. 16. 36 Lango, The Ethics of Armed Conflict, pp. 151–52. 37 Hurka, “Proportionality in the Morality of War,” p. 37. 39 Lango, The Ethics of Armed Conflict, p. 181. 40 Hurka, “Proportionality in the Morality of War,” p. 37. 41 Pattison, Humanitarian Intervention and the Responsibility to Protect, p. 82. 42 Lazar, Seth, “Necessity in Self-Defense and War,” Philosophy & Public Affairs 40, no. 1 (2012), pp. 7 9–15, 17, 20 (n. 22), 23, 25, 27, 41–42, 44. 43 McMahan, “Just Cause for War,” 3 (n. 3). 44 Gordon, Joy, Invisible War: The United States and the Iraq Sanctions (Cambridge, Mass. : Harvard University Press, 2010), p. 11. 45 Ibid., pp. 37, 87, 239; These high casualty figures are disputed. See Spagat, Michael, “Truth and Death in Iraq under Sanctions,” Significance 7, no. 3 (2010), pp. 116–20. 46 Drury, A. Cooper and Peksen, Dursun, “Women and Economic Statecraft: The Negative Impact International Economic Sanctions Visit on Women,” European Journal of International Relations 20, no. 2 (2014), pp. 463–90. 47 Peksen, Dursun and Drury, A. Cooper, “Coercive or Corrosive: The Negative Impact of Economic Sanctions on Democracy,” International Interactions 36, no. 3 (2010), pp. 240–64. 48 Christiano, Thomas, “An Instrumental Argument for a Human Right to Democracy,” Philosophy & Public Affairs 39, no. 2 (2011), pp. 142–76, doi:10.1111/j.1088-4963.2011.01204.x. 49 Allen, Susan and Lektzian, David, “Economic Sanctions: A Blunt Instrument?,” Journal of Peace Research 50, no. 1 (2013), pp. 121–35, doi:10.1177/0022343312456224. 50 Peksen, Dursun, “Better or Worse? The Effect of Economic Sanctions on Human Rights,” Journal of Peace Research 46, no. 1 (2009), pp. 59–77 , doi:10.1177/0022343308098404. 51 Allen and Lektzian, “Economic Sanctions: A Blunt Instrument?,” p. 132. 52 Power, Samantha, “A Problem From Hell”: America and the Age of Genocide (New York: Basic Books, 2002), p. 334. 53 David Jolly, “Death Toll in Syrian Civil War Near 93,000, U.N. Says,” New York Times, June 13, 2013, www.nytimes.com/2013/06/14/world/middleeast/un-syria-death-toll.html. 54 Rick Gladstone and Mohammad Ghannam, “Syria Deaths Hit New High in 2014, Observer Group Says,” New York Times, January 1, 2015, www.nytimes.com/2015/01/02/world/middleeast/syrian-civil-war-2014-deadliest-so-far.html. 55 Brunstetter, Daniel and Braun, Megan, “From Jus ad Bellum to Jus ad Vim: Recalibrating Our Understanding of the Moral Use of Force,” Ethics & International Affairs 27, no. 1 (2013), pp. 87–106 , doi:10.1017/S0892679412000792; Aloyo, Eamon, “Just Assassinations,” International Theory 5, no. 3 (2013), pp. 347–81, doi:10.1017/S1752971913000237; and Finkelstein, Claire, Ohlin, Jens David, and Altman, Andrew, eds., Targeted Killings: Law and Morality in an Asymmetrical World (Oxford: Oxford University Press, 2012). 56 Innocents can include soldiers fighting on the side with a just cause. For instance, McMahan argues that soldiers fighting with a just cause who respect jus in bello rules have not done anything to make themselves liable to defensive harm and are therefore innocent. See Jeff McMahan, Killing in War, 1st ed. (Oxford, U.K.: Oxford University Press, USA, 2009). 57 Walzer, Arguing About War, p. 155. * I would like to thank Michael J. Butler, Adam Hosein, Alison Jaggar, Joris Larik, Agnese Macaluso, Rens de Man, Claudia Mills, Alistair Norcross, Heather Roff, Ajume Wingo, Ting Zhang, and the audiences at the 2014 International Studies Association Annual Conference and the 2014 workshop on “The Ethics of War and Intervention” at the University of Birmingham for their helpful feedback on this article. For taking the time to provide written suggestions, I would like to thank David Connolly, Tessa Alleblas, and especially Scott Wisor. Thanks to David Mapel for useful discussions and encouraging me to develop the ideas in this article. I would like to gratefully acknowledge the support of The Hague Institute for Global Justice. The views expressed in this article are the author's alone. Finally, I would like to thank the three anonymous reviewers and the editors of this journal for their helpful comments and suggestions, which substantially improved this article.